Afterschool & Summer Learning | IBA Boston | Inquilinos Boricuas en Acción empowers and engages individuals and families to improve their lives through high-quality affordable housing, education, and arts programs. IBA’s Afterschool and Summer Learning Program is an academic and arts integrated program offered to English Language Learning children in first and second grade. 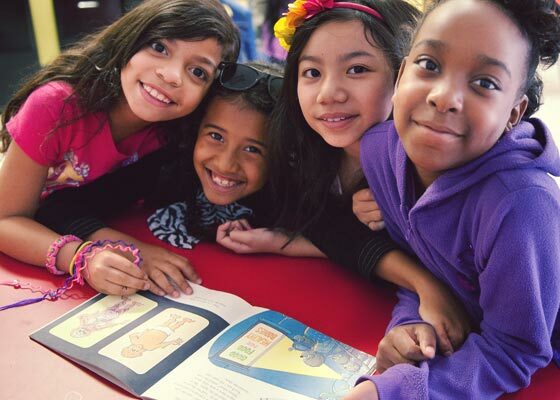 Our goal is to improve students’ from the Blackstone Innovation School English language and reading skills, to support social and emotional development, to encourage creativity and to prevent learning loss during the summer. Our strong arts component helps our students increase their language skills and self-esteem, and equips them for academic success. The program engages students through multiple learning models, and offers reading mentorship, arts and homework support, as well as other community activities. Parent engagement is a priority and includes a culturally competent approach and various events that showcase students’ work and celebrate their successes. Program staff also connects parents with other IBA programs and services, like GED, Job Readiness, and college classes through Bunker Hill Community College, and more community resources. "I think the program is excellent because it has helped my children do their homework without difficulty and be more social while sharing and doing activities with friends. They feel quite well and the teachers are very good and loving with children." Open to Blackstone Innovation School English Language Learners in 1st and 2nd grade. October to June, Monday through Friday from 3:00 p.m. – 5:00 p.m. with free snack. Registration runs from the end of August – mid September. Open to English Language Learners who are entering 2nd and 3rd grade in Boston Public Schools in September 2018. July to August (for 5 weeks), Monday through Friday from 8:30 a.m. – 2:45 p.m. with free breakfast and lunch. Registration runs April through the end of May 2018. For more information, please contact Shannon Hayes at (617) 535-1731 or shayes@ibaboston.org. For information specifically about the summer program you can also take a look at our frequently asked questions here.